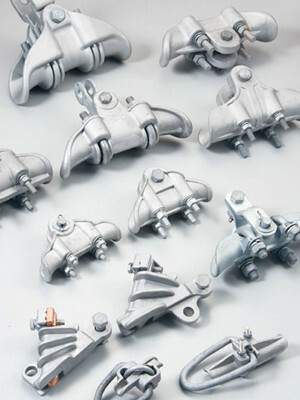 Product categories of Suspension Clamp, we are specialized manufacturers from China, Suspension Clamp, Cable Suspension Clamp suppliers/factory, wholesale high-quality products of Aluminum Alloy Suspension Clamp R & D and manufacturing, we have the perfect after-sales service and technical support. Look forward to your cooperation! Suspension Clamp is used for binding aluminum belts or wire protective bars outside the conducting wires when laying aluminum strand cable or steel core aluminume strand cables. The applicable outer diameter of conducting wires includes the wrapping material. The clamp body and keepers are aluminium alloy, cotter-pin is stainless steel, the other parts are hot-dip galvanized steel. Suspension clamps are used to hang conductor or ground wire through insulators or Link Fitting to tower arms or substation structures.The clamps are made of malleable iron or aluminium alloy. The suspension angle of suspension clamps is not less than 25℃,the radius of curvature is not less than the dia of installed leads by 8,and the percentage of the grip on different kinds of leads to the calculating capability of snap show in following table. As the suspension clamps are used to AAC and ACSR,the conductor may be wound by aluminium tapes or preformed armour rods for protecting these taps or rods are included in the diameter of suitable conductor.